Testing a gas golf cart solenoid is relatively easy. However, you must first perform some preliminary checks on other components to determine if the solenoid is not only getting the power it needs, but also the input from various other components to “throw” into the closed (ON) position. First check your battery reference voltage. You can do this by checking across the positive and negative terminals of your battery with a voltmeter. It should be somewhere close to 12 VDC, give or take a few tenths. Write down your battery reference voltage for use later. You must also test both the key switch and the accelerator micro switch BEFORE testing a golf cart solenoid. Both of these components are wired into the control circuit of the solenoid and if they are malfunctioning, the solenoid will not operate. A quick foreword on this principle is that on some vehicles, the micro switch powers the key switch, and on other models, it is opposite. For this reason, you may find you have the test one before the other to have power at the described locations. All tests and pictures shown here were performed on a 2010 4 Cycle EZGO Workhorse. 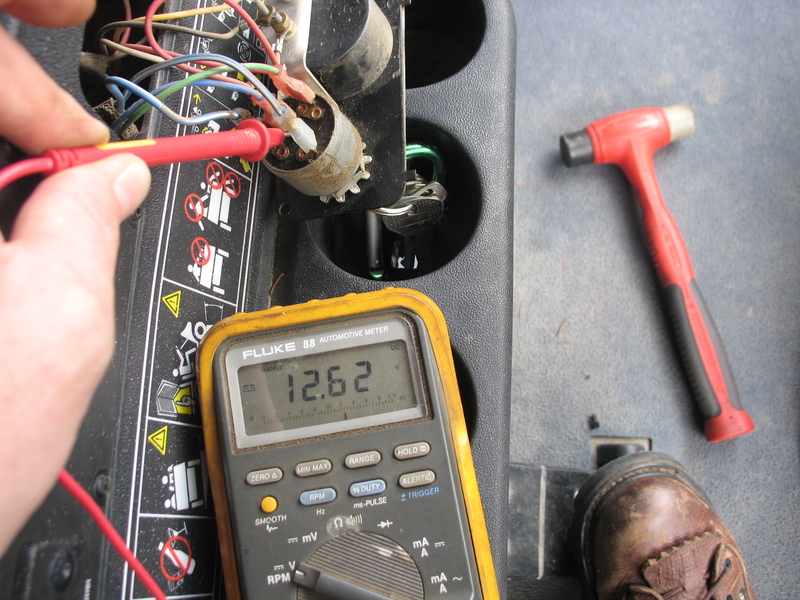 When the micro switch is activated, with the key ON or OFF in a gas golf cart, it allows battery reference voltage to flow to the key switch in many cases. But, it stops there, until key switch is turned ON to allow the power to activate the solenoid. This signal or power flow from the key switch and micro switch causes the contacts inside the solenoid to “throw” and make contact to conduct power through it to the starter/generator. So, we must test these switches first before moving onto the actual solenoid. 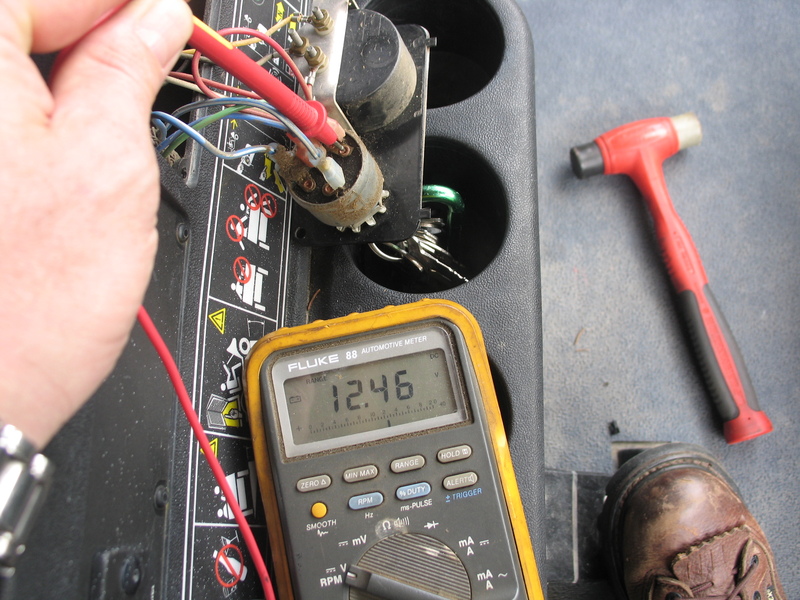 A typical accelerator micro switch on a gas golf cart only has two terminals as well, a common and either a normally closed (NC) or normally open (NO) depending on the year and model. However, our test is generic and applicable to most carts. Again, leave your black probe on the battery negative terminal and use your red probe for testing. With the key switch ON, you should read battery voltage at the common terminal (C or COM), but not the other terminal. Once the micro switch is activated, you should read voltage on both terminals. Most gas vehicles have a simple two terminal key switch. Leave your black voltmeter probe on the negative battery terminal and use your red probe for testing. With the key switch OFF, and pedal depressed, you should only have battery reference voltage (around 12 VDC) on one terminal of the switch but not the other. When the switch is turned ON, you should be able to read battery voltage on both terminals. This would indicate the switch is functioning normally and allowing power to flow to the solenoid’s control circuit when ON. The vehicle shown below has a four terminal three position switch. The green wire provides power from the micro switch and the center blue wire carries power out to the solenoid. Shown here, the key is OFF, but the pedal must be depressed to send the battery voltage to the key. Sample picture shown below now shows power flowing out to the solenoid via the middle blue wire from the key switch. The power is only present on this terminal when the key is ON and the pedal is depressed to activate the micro switch. If it and the key switch both test good, move onto the solenoid. Finally, to the procedure of the day……testing a gas golf cart solenoid. As before, leave your black probe on the battery negative and use your red probe for testing. On the incoming large power post of the solenoid (generally the side with a wire to battery positive terminal), test for voltage. It should be very close to your battery reference voltage number. However, if you test on the outgoing large power post, you should not read battery voltage UNLESS the accelerator micro switch and key are both activated and working. You may read a couple volts just as “bleed through” voltage, but nothing close to battery voltage. 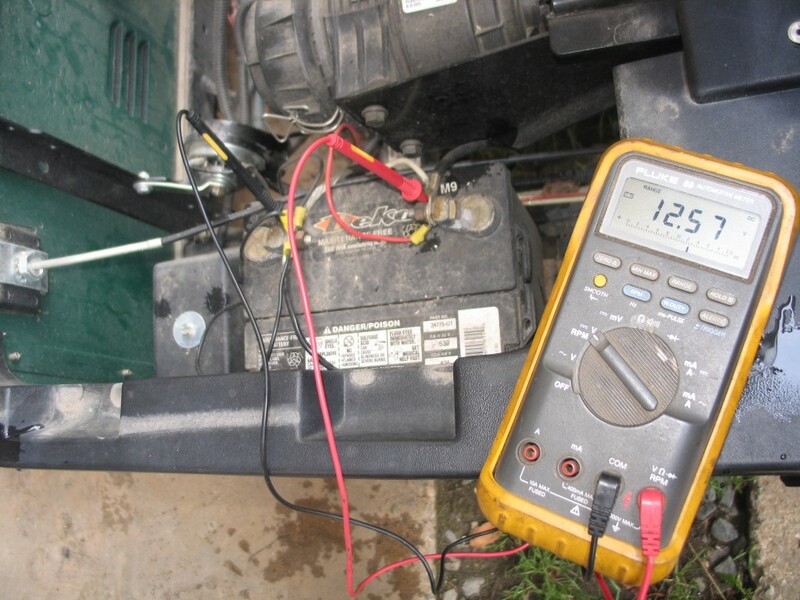 Once the solenoid has thrown and engaged, you should be able to read battery voltage on either large post. At this point, if the key switch, accelerator micro switch, and solenoid are all operating properly and check within the specs above, your starter/generator should start turning over the engine. Just because the engine turns over does not always mean it is going to start. If your tests reveal the solenoid and other related components test within specs, but your starter does not turn, you could have issues with the brushes or other problems. If the starter turns, but it doesn’t not fire up and run, you may have larger engine, ignition or fuel related issues which we’ll cover in a later tutorial. We sincerely hope you’ve enjoyed our tutorial on testing a gas golf cart solenoid. Delta Q Chargers - What's the Red Flashing LED mean?